Welcome to Starengu's podcast (www.starengu.com)! This podcast is dedicated to highlighting the journey of bloggers and entrepreneurs to inspire you to pursue your dreams. Creating your blog is the first step to investing in yourself. Blogs allow you the ability to connect with other people who share the same interests as you. Share your stories and talents with us. You never know who you may inspire! I have a love hate relationship with Fiverr. That relationship recently turned closer to hate once I realized how vulnerable freelancers were with getting paid for large scaler projects. Learn why I will never take another large dollar amount project on Fiverr. Learn why it’s important to find your voice. A tale of two customer service experiences. As business owners, we need to make sure that we don't fall by the wayside. Discover why in this episode. Are you in charge of your life? Many people believe that they are in charge of their life. However, if you're constantly living your life based on how well you live up to other's expectation of your life, then you need to reevaluate your answer. Learn how to make the adjustments you need to make in order to truly be in charge of your life. In today's episode, find out how Adeola grows and retains her natural hair growth, creator of CoilsandGlory.com. (https://www.coilsandglory.com/) Thanks so much for listening to today's podcast. I’m confident that my side hustle of helping others to invest in themselves via my youtube channel, podcast, and most importantly my online courses can be of assistance to you. If you enjoy Starengu’s podcast, please consider becoming a supporter of by donating to help offset the cost of producing this show. :) Be sure to check out Starengu's Ultimate Social Media Content Calendar. Remember, if you’re everything to everyone then you risk being no one. You never know who you may inspire. See you in the next episode! In today's episode, discover how Albany Chanel's mission to encourage inspiration and ideas behind giving more genuine gifts (https://givegorgeously.com/) Thanks so much for listening to today's podcast. I’m confident that my side hustle of helping others to invest in themselves via my youtube channel, podcast, and most importantly my online courses can be of assistance to you. If you enjoy Starengu’s podcast, please consider becoming a supporter of by donating to help offset the cost of producing this show. :) Be sure to check out Starengu's Ultimate Social Media Content Calendar. Remember, if you’re everything to everyone then you risk being no one. You never know who you may inspire. See you in the next episode! In today's episode, learn how Ilia Francis and Adriana Romero creators of Our Little Venice (https://www.ourlittlevenice.com/) empower, inspire, and support immigrant women on their professional and entrepreneurial journeys. Thanks so much for listening to today's podcast. I’m confident that my side hustle of helping others to invest in themselves via my youtube channel, podcast, and most importantly my online courses can be of assistance to you. If you enjoy Starengu’s podcast, please consider becoming a supporter of by donating to help offset the cost of producing this show. :) Be sure to check out Starengu's Ultimate Social Media Content Calendar. Remember, if you’re everything to everyone then you risk being no one. You never know who you may inspire. See you in the next episode! In today's episode, discover how Erin Demoney, a busy stay at home mom, fitness enthusiast and full-time blogger has taken planning and journal pages to a whole new level. Check out The Petite Planner (https://thepetiteplanner.com/). Thanks so much for listening to today's podcast. I’m confident that my side hustle of helping others to invest in themselves via my youtube channel, podcast, and most importantly my online courses can be of assistance to you. If you enjoy Starengu’s podcast, please consider becoming a supporter of by donating to help offset the cost of producing this show. :) Be sure to check out Starengu's Ultimate Social Media Content Calendar. Remember, if you’re everything to everyone then you risk being no one. You never know who you may inspire. See you in the next episode! In order to be notified when new content is available, please be sure to subscribe to my podcast on Anchor, iTunes, Spotify and Google Play. Mi’esha Reynolds is the founder of Be Spiritually Bold (https://bespirituallybold.com/) and her mission is to help women step out in faith in order to achieve their endeavors. Thanks so much for listening to today's podcast. I’m confident that my side hustle of helping others to invest in themselves via my Youtube channel, podcast, Facebook Group, and most importantly my online courses can be of assistance to you. My courses are geared towards teaching people how to create their own website, and promote their endeavor through digital marketing, and so much more. You never know who you may inspire. If you enjoy Starengu’s podcast, please consider becoming a supporter of by donating to help offset the cost of producing this show. :) In order to be notified when new content is available, please be sure to subscribe to my podcast on Anchor, iTunes, Spotify and Google Play. Happy New Year! If learning a language is on your bucket list, then you're going to love today's podcast. As many of you know, I’ve got quite a few side hustles and teaching English online is one of them. It’s something that I thoroughly enjoy and has allowed me the opportunity to meet amazing people like Yul. If learning a language is on your bucket list then you’re in for a treat. He is going to share techniques that have enabled him to learn 3 languages. Thanks so much for listening to today's podcast. I’m confident that my side hustle of helping others to invest in themselves via my youtube channel, podcast, and most importantly my online courses can be of assistance to you. If you enjoy Starengu’s podcast, please consider becoming a supporter of by donating to help offset the cost of producing this show. :) Be sure to check out Starengu's Ultimate Social Media Content Calendar. Remember, if you’re everything to everyone then you risk being no one. You never know who you may inspire. See you in the next episode! In order to be notified when new content is available, please be sure to subscribe to my podcast on Anchor, iTunes, Spotify and Google Play. What will your theme be in 2019? In today's episode, we will discuss why and how to create a goal setting formula. I will also share my theme word for 2019. What will your word be? Thanks so much for listening to today's podcast. I’m confident that my side hustle of helping others to invest in themselves via my youtube channel, podcast, and most importantly my online courses can be of assistance to you. If you enjoy Starengu’s podcast, please consider becoming a supporter of by donating to help offset the cost of producing this show. :) Be sure to check out Starengu's Ultimate Social Media Content Calendar. Remember, if you’re everything to everyone then you risk being no one. You never know who you may inspire. See you in the next episode! In order to be notified when new content is available, please be sure to subscribe to my podcast on Anchor, iTunes, Spotify and Google Play. In today's episode, we will learn why it's important for you to create a personal brand (especially if you work a 9 to 5). Be sure to download the personal branding checklist (https://starengu.com/why-should-i-care-about-creating-a-personal-brand) Thanks so much for listening to today's podcast. I’m confident that my side hustle of helping others to invest in themselves via my youtube channel, podcast, and most importantly my online courses can be of assistance to you. If you enjoy Starengu’s podcast, please consider becoming a supporter of by donating to help offset the cost of producing this show. :) https://anchor.fm/starengu/support Remember, if you’re everything to everyone then you risk being no one. You never know who you may inspire. See you in the next episode! Many companies expect their employees to work themselves to death. As Americans, we typically only receive 2 to 3 weeks vacation (much less than our friends overseas receive). So imagine my surprise when I was asked to work during my vacation. I know you already know the answer (it's in the title), but find out why and some other thoughts I share as well (i.e. tackling the Angry Black Woman stereotype). Be sure to connect with me on my website, Facebook and Pinterest. There aren't any true shortcuts in life. That's why it's important for you to learn how to take the stairs. Thanks so much for listening to today's podcast. I’m confident that my side hustle of helping others to invest in themselves via my youtube channel, podcast, Facebook Group, and most importantly my online courses can be of assistance to you. My courses are geared towards teaching people how to create their own website, and promote their endeavor through digital marketing, and so much more. You never know who you may inspire. If you enjoy Starengu’s podcast, please consider becoming a supporter of by donating to help offset the cost of producing this show. :) In order to be notified when new content is available, please be sure to subscribe to my podcast on Anchor, iTunes, Spotify and Google Play. Are you an imposter? So many people go through life feeling like they don't deserve the attention or compliments they receive when they achieve their goals. Discover why this is the case. Thanks so much for listening to today's podcast. I’m confident that my side hustle of helping others to invest in themselves via my youtube channel, podcast, Facebook Group, and most importantly my online courses can be of assistance to you. My courses are geared towards teaching people how to create their own website, and promote their endeavor through digital marketing, and so much more. You never know who you may inspire. If you enjoy Starengu’s podcast, please consider becoming a supporter of by donating to help offset the cost of producing this show. :) In order to be notified when new content is available, please be sure to subscribe to my podcast on Anchor, iTunes, Spotify and Google Play. Discover why playing passive-aggressive games is not a good idea. If you have enjoyed the content provided by the Starengu’s podcast, please consider becoming a supporter by donating any amount you feel compelled to give to help offset the cost of producing this show. I’m confident that my side hustle (www.starengu.com ) of helping others to invest in themselves via my youtube channel, podcast, Facebook Group, and most importantly my online courses can be of assistance to you. My courses are geared towards teaching people how to create their own website, and promote their endeavor through digital marketing, and so much more. Remember if you are everything to everyone then you risk being no one. You never know who you may inspire. See you in the next podcast! In today’s episode, I had the absolute pleasure of speaking with Rey Ibarra. He is the owner and creator of Rey Ibarra Media network. His company is responsible for hosting Sharks & Stripes, which is a networking event featuring successful entrepreneurs from the hit show Shark Tank in order to help Military Entrepreneurs/Veterans and their spouses to start their own successful business. Rey is an incredibly inspiring person. I’m confident that you are going to enjoy and learn so much from this interview. Don’t forget to check out Rey’s free Success Strategies Video series. Thanks so much for listening to today's podcast. I’m confident that my side hustle of helping others to invest in themselves via my courses are geared towards teaching people how to create their own website, and promote their endeavor through digital marketing, and so much more. You never know who you may inspire. See you in the next podcast! What message does your brand convey? Discover the top three components you should take into consideration when creating your brand. Why would I pay for a voice over? Discover 3 reasons why people pay for voice over talent. Thanks so much for listening to today's podcast. If this podcast has been helpful to you, please check out my other website https://starengu.com. I’m confident that my side hustle of helping others to invest in themselves via my youtube channel, podcast, and most importantly my online courses can be of assistance to you. My courses are geared towards teaching people how to create their own website, and promote their endeavor through digital marketing, and so much more. Remember, if you're everything to everyone then you risk being no one. You never know who you may inspire. See you in the next podcast! Do you know when to outsource? Why do you need to be selfish in business? In today’s podcast, we're going to discuss how to be selfish. Now I know that title sounds pretty crazy because let's face it when you're kids it's ingrained in you that you don't want to be selfish. However, as you grow older you need to have a balance in life. Discover three areas that you have to be selfish in otherwise you're setting yourself up for failure. Thanks so much for listening to today's podcast. If this podcast has been helpful for you, please be sure to check out my website https://starengu.com. I’m confident that my side hustle of helping others to invest in themselves via my youtube channel, podcast, and most importantly my online courses can be of assistance to you. My courses are geared towards teaching people how to create their own website, and promote their endeavor through digital marketing, and so much more. You never know who you may inspire. See you in the next podcast! In the last podcast, I spoke about the need to start a side hustle. However, what if you don't know what options are out there? In this podcast, I give you some ideas about a variety of avenues that you can explore to help you find the platform that will enable you to express your message. Thanks so much for listening to today's podcast. I’m confident that my side hustle of helping others to invest in themselves via my youtube channel, podcast, Facebook Group, shop and most importantly my online courses can be of assistance to you. My courses are geared towards teaching people how to create their own website, and promote their endeavor through digital marketing, and so much more. You never know who you may inspire. See you in the next podcast! When you're surrounded by negativity, it can be difficult to stay motivated. I'm here to tell you, why it's important not to throw in the towel. Weekend Warrior Convo: Is College Still Worth the Investment? In today's podcast, I'm talking with Anthony Kemp Jr. from Knowledgeable Purpose in whether college is still worth the investment. Be sure to check out Starengu's website in order to get the list of sites referenced throughout our conversation. Remember, if you’re everything to everyone then you risk being no one. Creating your blog is the first step to investing in yourself and allows you the ability to connect with other people. If you’re interested in creating your own website, your own videos or learning more about digital marketing go to starengu.com. I’m confident that you will find a course to help you with your endeavors. You never know who you may inspire. See you in the next podcast! Discover how important it is to cross promote your content. Not sure how accomplish this feat? Check out 23 ways to show you how to repurpose your content. Download the free checklist. https://starengu.com/how-to-repurpose-your-blog-content/ Remember, if you’re everything to everyone then you risk being no one. Creating your blog is the first step to investing in yourself and allows you the ability to connect with other people. If you’re interested in creating your own website, your own videos or learning more about digital marketing go to starengu.com. I’m confident that you will find a course to help you with your endeavors. You never know who you may inspire. See you in the next podcast! Weekend Warrior Tip: Why should you always have a contract? When you decide to work with someone, having a contract will allow both parties to protect themselves. Discover why contracts are the best way to stay on the same page. Remember, if you’re everything to everyone then you risk being no one. Creating your blog is the first step to investing in yourself and allows you the ability to connect with other people. If you’re interested in creating your own website or learning more about digital marketing go to starengu.com. I’m confident that you will find a course to help you with your endeavors. You never know who you may inspire. See you in the next podcast! There have been numerous studies about how people are not working in their dream job. Most people think the best way to change this statistic for you to start your own business. I decided that I would be one of those “crazy” people who pursued their passion while bringing in a steady income. Don't forget to download your free After 9 to 5 Thrive Guide (https://goo.gl/UdC6MV). Remember, if you’re everything to everyone then you risk being no one. Creating your blog is the first step to investing in yourself and allows you the ability to connect with other people. If you’re interested in creating your own website or learning more about digital marketing go to starengu.com. I’m confident that you will find a course to help you with your endeavors. You never know who you may inspire. See you in the next podcast! In today’s podcast, I’m talking to Dr. Toni-Ann Mayembe. She is a dentist, wife, and mom to two little boys. Toni is on a mission to provide advice to help improve and maintain their children’s dental health. Don't forget to download your free After 9 to 5 Thrive Guide (https://goo.gl/UdC6MV). Thanks so much for listening to today's podcast. Remember, if you’re everything to everyone then you risk being no one. Creating your blog is the first step to investing in yourself and allows you the ability to connect with other people. If you’re interested in creating your own website or learning more about digital marketing go to starengu.com. That's STARENGU.com I’m confident that you will find a course to help you with your endeavors. You never know who you may inspire. See you in the next podcast! Learning another language will open more doors for you to explore. However, this is easier said than done. Check out my advice in how you can learn Spanish. Download the free Spanish to English Popular Idiom book: https://starengu.com/how-to-master-spanish-when-you-dont-have-time/ Thanks so much for listening to today's podcast. Remember, if you’re everything to everyone then you risk being no one. Creating your blog is the first step to investing in yourself and allows you the ability to connect with other people. If you’re interested in creating your own website or learning more about digital marketing, I’m confident that you will find a course to help you with your endeavors. You never know who you may inspire. See you in the next podcast! Welcome to Starengu, I’m your host Tosha Johnson. I’m super excited to introduce you to China McNeal. She has been a hairstylist for over 20 years and owns a very popular chic hairstyle salon called ChiHairImports. Ladies, I can tell you firsthand she is absolutely amazing because she’s my hairstylist. If you have enjoyed this podcast, I'm confident that my side hustle of helping others to invest in themselves via my online courses can help you as well. My courses are geared towards teaching people how to create their own website, promote their own brand and so much more. You never know who you may inspire. See you in the next podcast! Discover how to create a winning goal setting formula that will enable you to create and effectively track your progress in achieving those goals. If you are interested in following my goal setting formula approach then check out this blog post and be sure to download the FREE goal setting approach guide which includes your very own set of grateful notes. You're welcome! :) https://starengu.com/goal-setting/ Thanks so much for listening to today's podcast. Remember, if you’re everything to everyone then you risk being no one. Creating your blog is the first step to investing in yourself and allows you the ability to connect with other people. If you’re interested in creating your own website or learning more about digital marketing go to starengu.com. That's STARENGU.com I’m confident that you will find a course to help you with your endeavors. You never know who you may inspire. See you in the next podcast! Tip #4 Is Your Elevator Speech Pushing the Right Buttons? Learn how to create an elevator speech that pushes the right buttons so you can both get off on the same floor together. If you have enjoyed this podcast, I’m confident that my side hustle of helping others to invest in themselves via my online courses can be of help to you (https://www.starengu.com). My courses are geared to teaching people how to create their own website, and promote their endeavor through digital marketing, and so much more. You never know who you may inspire. See you in the next podcast! Larry Hunter is a Christian who hosts a very successful podcast and YouTube channel called 5 Minute Inspirationz, a book called Dare to Dream Again and last but not least, a blog called LarryHunter.org. Larry’s missionary work has taken him and his family to over 12 different countries (Honduras, Brazil, Guatemala, etc. ). His book Dare To Dream Again (it is available on Amazon in English and Spanish) teaches people how to overcome obstacles that they encounter in their life so they can pursue their dreams. I also share in Larry’s zeal for life. My goal is to help you both spiritually and physically. If this podcast has been a blessing to you, I’m confident that my side hustle of helping others to invest in themselves via my online courses can be of help to you. My courses on (https://starengu.com) are geared towards teaching people how to create their own website, and promote their endeavor through digital marketing, and so much more. You never know who you may inspire! You can't launch a business without a rock solid system in place to help you organize all of the tasks that you need to complete. Find out how to reign in your lack of direction in today's podcast. Remember, if you’re everything to everyone then you risk being no one. Creating your blog is the first step to investing in yourself and allows you the ability to connect with other people. If you’re interested in creating your own website or learning more about digital marketing go to starengu.com. I’m confident that you will find a course to help you with your endeavors. You never know who you may inspire! You finally decided this is the year to make the dream of launching your business a reality! Make sure that conducting market research made the list. Be sure to join us in our private Facebook group called Goal Slayers (https://www.facebook.com/groups/GoalSlayers). Starengu's podcast is dedicated to inspiring you to soar to new heights in blogging and business. In episode 4, meet Lisa Irby who blogs at Passive Shirt Profits. Her blog is dedicated to providing print on demand resources. 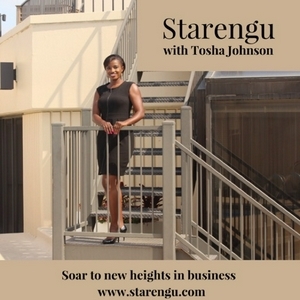 Starengu's podcast is dedicated to inspiring you to soar to new heights in blogging and business. In episode 3, meet Shahidah Foster who blogs at Black Girls Learn Languages . Her blog is dedicated to providing resources and content to help black women learning languages. Starengu's podcast is dedicated to inspiring you to soar to new heights in blogging and business. In episode 2, meet Nicole Butler who blogs at Budget Like a Lady. Her blog is dedicated to helping women balance their life and money.